DF-760 NanoTrace Dual Mo. and Oxygen An. 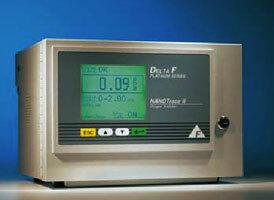 The NanoTrace II provides the lowest detection level (LDL) in the industry. NanoTrace II provides the lowest LDL in the industry. Part of the extensive APIMS testing by several third parties, including SAES Pure Gas Inc., is shown. NanoTrace II is an extension of the first NanoTrace used in semiconductor fabs and analytical carts around the world. It features a lower LDL, Data Graphing, Scheduled Automatic Calibrations, Automated Maintenance Logging, and a variety of other new capabilities. Every NanoTrace is manufactured under ISO 9001 control and is calibrated and operated for five weeks to ensure a fast and accurate start-up at your site. Executes automatic zero and span calibrations on a scheduled basis, or executes scheduled automatic "checks" and issues a notice when calibration is needed. Automatic Maintenance Log records water additions, sensor data, and calibration activity to ensure good analytical practice and ISO record-keeping requirements. Builds 4 day and 30 day graphical records of analyzer readings. A "Zoom" feature provides a close look at data anywhere in the long term record. Select "Fill and Stop" or "Continuous" data collection modes. Gas Compatibility: All inerts and passive gases including N2, He, H2, Ar, light hydrocarbons, halocarbons, etc. For more information, click here to view the DF-560 datasheet pdf.